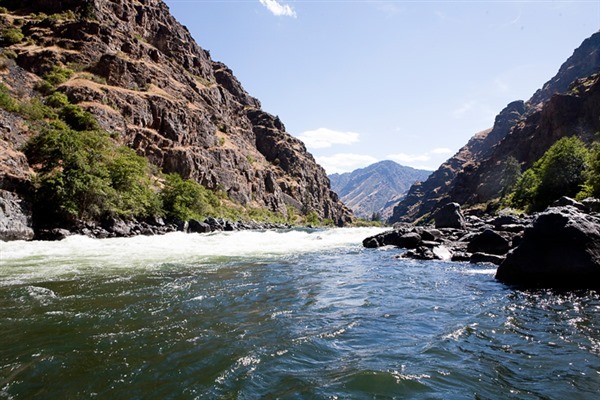 Hike up and over the Seven Devil Mountains down into a whitewater adventure in Hells Canyon! The Northwest has few mountain ranges that compare with the Seven Devils. They feature incredible scenery and a huge variety of trails. The Seven Devils Mountains extend along the Idaho/Oregon border for roughly 40 miles running South to North. They boast such names as Devils Throne, Tower of Babel, Twin IMPS, The Orge, The Goblin, He Devil and She Devil. The mountains are bordered by the Snake River to the West and the Salmon River to the East. They are Idaho’s most spectacular mountain range, with elevations varying from 1,000 feet at the Snake River to 9,393 feet on the summit of He Devil. July though October are the best months for hiking. Snow generally restricts passage making it inaccessible the rest of the year. 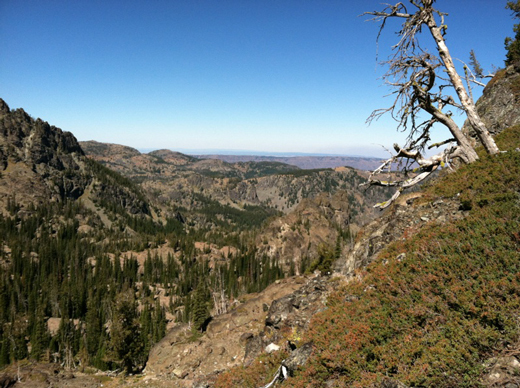 There are many side hikes to enjoy such as Dry Diggins Look Out (an old Forest Service Tower above Hells Canyon that looks out over hundreds of miles of Oregon and Washington), Rapid River, Goat Pass, Sheep Creek and The Old Boise trail just to name a few. 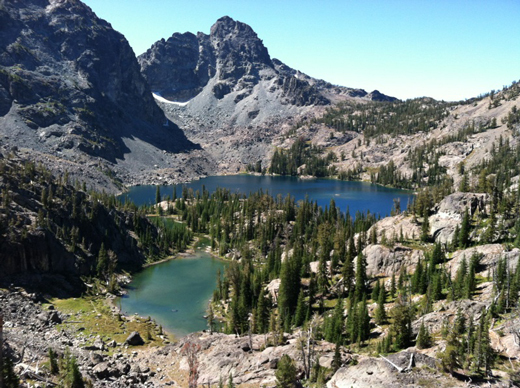 This range is incredibly rich with history; let ARC lead the way and show you the best backpacking Idaho has to offer. America’s Rafting Company is taking the back out of Seven Devils Backpacking by offering our customers the “pack-light option.” This allows you to take just the basics and explore the mountains while your tent, extra clothes, sleeping bag & sleeping pad await you at the next designated camp site aside one of the many crystal blue lakes. Did we mention dinner? That’s right, not only are your tents set up, but you’ll also have a gourmet dinner prepared for you as you stroll into camp. In the morning, a hearty breakfast is served, and you’ll be on your way. Another perk hiking with a rafting company is that you don’t have to go back the same way you came. 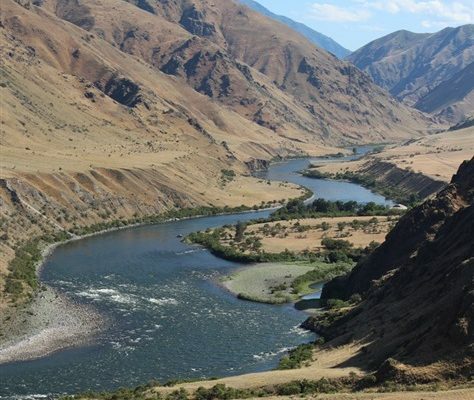 Instead, we will take a path less traveled down into Hells Canyon, the deepest canyon in America, where we will spend the next 2-3 days whitewater rafting down the mighty Snake River. Of course, we offer traditional backpacking which gives you the thrill and satisfaction of being completely self-reliant, seeing places that you couldn’t otherwise see, and offering a great means of travel. 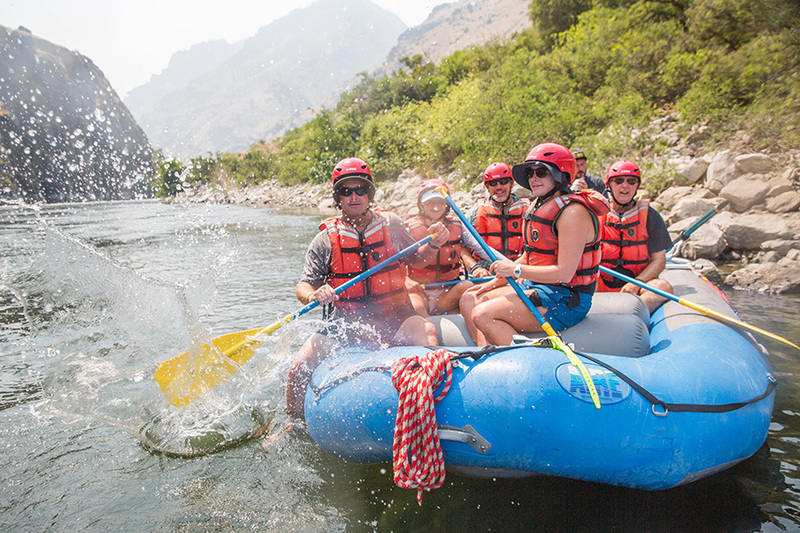 Combine that with whitewater rafting on a Snake River trip, or just take a jet boat ride out of Hells Canyon. Now you have the making of a unique once in a lifetime adventure! Seven Devils Backpacking is rated CHALLENGING. It involves some uneven terrain and steep rocky slopes, but for the most part the trail is well maintained. The most difficult sections are taken with as much time and attention as necessary. 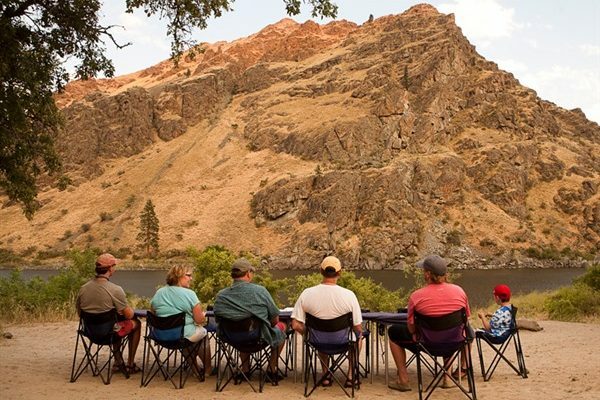 If part or your party is uncomfortable with challenging hikes, they can skip the hike and float into Hells Canyon on rafts and meet you at the end of your hike! 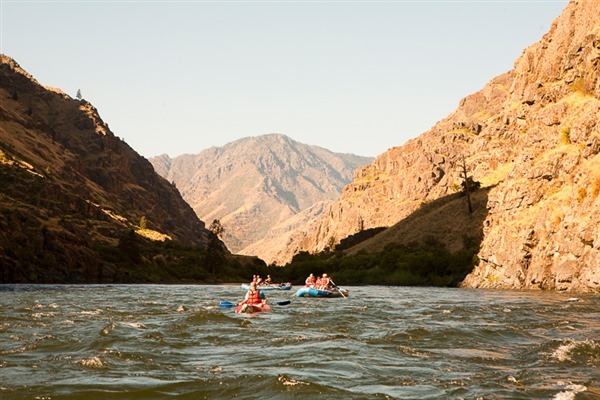 The Hells Canyon Snake River Trip is rated EASY; it is a Class III-IV river (primarily Class IIIs with a few Class IVs). It is a big volume, pool and drop river. While most rapids are not technically difficult, they are a lot of fun with big waves and a big ride! For a quicker trip, a jet boat ride out of the canyon is an excellent choice. It is rated VERY EASY and takes an afternoon. Just sit back and enjoy the scenic ride out. Day 1: After and early departure, we’ll arrive at Windy Saddle, the starting point of our hiking adventure. Each day we will face challenging hikes with huge rewards and amazing views. We typically arrive at our lakeside camp around 4:00 or 5:00 where you can swim, fish, have a drink, read a book or just relax and unwind after a spectacular day on the mountain. A Typical Day On the Mountain: After sleeping under an incredible Idaho starlit sky, you’ll wake in the morning to the enticing aroma of gourmet coffee. After a delicious hot breakfast, we are back on the trail to experience, learn, explore and enjoy. These days have the same flow as Day 1, stocked with awesome terrain, pristine lakes, interesting history, great food, and great fun. On our last day of hiking, we spend the night camping on banks of the Snake River. 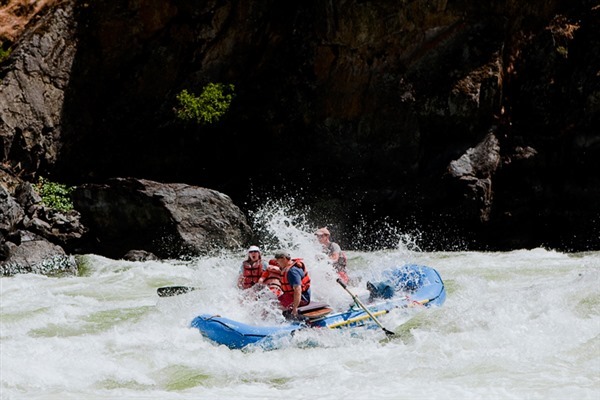 Our First River Day: Starts off with a bang; as we reach the first of major Class IV’s – Granite creek Rapids. We’ll scout the rapid before running it, after that we will have several Class II & III rapids as we drift downstream to camp, arriving in the late afternoon. The camp is already set up, which means your only job is to enjoy the surroundings. You can relax, swim, fish or play bocce ball. A fine dinner is prepared in our gourmet river kitchen with fresh bread, great entrées and topped off with a decedent dessert. A Typical River Day: Is loaded with Idaho’s famous whitewater, calm swimming pools, interesting history, wonderful food, and plenty of fun. Soon enough, you will start slipping into what we call “river time”. No clocks, no cell phones, no computers, just you and all the time in the world. There are many optional hikes on the river offering spectacular views of the canyon and river below. Last day: We typically arrive back to civilization at 2:00pm, where we quickly load our boats and head back to the Civilization. Note for making departing flights after the trip: Please do not schedule any departing flights for the last day of the river trip. Most people prefer to spend this last night in Idaho and drive to Boise in the morning to catch an early afternoon flight. If you must catch a morning flight, you will most likely prefer to drive to Boise on the last night of the trip and expect to arrive in Boise around 7-8 p.m. Call us if you have any questions about appropriate flight times. In July and August, the weather on our rivers in Idaho is typically warm and beautiful, with only a slight chance of precipitation. Average highs are in the 90s and average lows in the high 50s to 60s. We do have a week or two that can be considerably hotter, with daytime highs exceeding 100F. In normal summer conditions (warm and dry), we recommend bathing suits, quick dry shorts, long or short sleeve cotton shirts, long light weight pants and hat and sunglasses for protection from the sun. In the summer, we do actually RECOMMEND cotton clothing for very hot weather as it stays wet and helps cool your body temperature. However, cotton is NOT RECOMMENDED for cooler weather. So, you should pack some non-cotton layers even in the summer in the rare event of cooler weather. While in the raft or kayak you should wear sturdy shoes that will stay on your feet, they should be comfortable when wet. Sandals with heel straps, such as Teva or Chaco sandals are ideal. Water shoes like those made by Keen are also great. Tennis Shoes will work, but tend to get wet and stay wet throughout the day. In camp, it’s a great feeling to take off your wet shoes, find the dry ones you packed and kick back and reminisce about the day spent on the water. Some people prefer tennis shoes, light hiking shoes or sandals. Either option is typically fine on our short hikes in and around, but some people may prefer to bring a pair of hiking boots for longer hike. ARC will supply each person with a large overnight bag for your clothing, sleeping gear, toiletries, etc. It will have plenty of room for one sleeping bag and one good-sized duffle bag. This bag should contain items that you will not need until you arrive at the evening’s camp. For the items you will need during the day we will supply one medium sized bag for two people to share. The smaller personal bag will stay with you on the boat and you will have access to it throughout the day. Items such as chap-stick, sun screen a warm fleece or rain jacket and camera can be stored in here. We supply you with NRS Dry Bags that are water tight. If packed and sealed correctly, your bag will stay dry under most conditions. ARC guides will help you ensure that they are sealed properly. In order to protect important items, such as cameras, medications, etc. it would be a good idea to bring extra zip-lock bags. If you are planning on bringing an expensive camera, we recommend that you purchase a dry box, such as a pelican case. Call the office for more information about properly storing and packing important items, we’ll be happy to help. Please contact us or call at 208-347-3862 to schedule trip dates. The Hell, Hike and Raft Trips are very customizable! The Snake River offers excellent fishing opportunities. You’ll be able to fish from the bank during lunch and in camp and you can always fish from the boats during the day. You will need to obtain a valid Idaho fishing license. 5-6 weight floating line with medium to fast sinking tip-Bass flies: Varies.